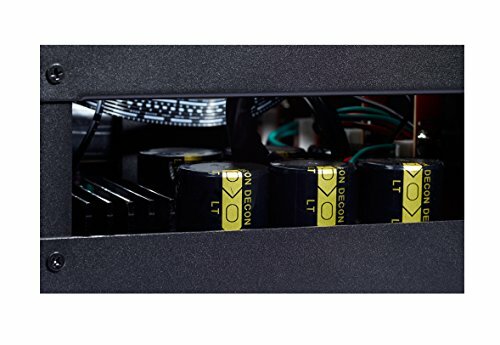 Steve Withers finds out if this new seven-channel Class AB power amplifier makes an iota of difference in his cinema room. IF THE NAME IOTA isn’t familiar to you, then you’re not alone. To be honest, I’d never heard of the company before this seven-channel power amplifier arrived at my door. A bit of digging later, I discovered it’s a British electronics brand, based in Middlesbrough, focused on the design and construction of stereo and home cinema hardware. It combines its engineers and technicians with ‘efficient production’ and a streamlined sales infrastructure (you can buy directly from the manufacturer), to offer well- made and competitively priced products. 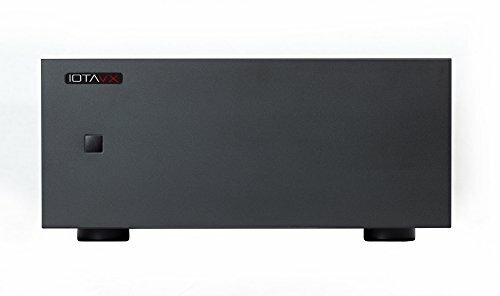 The range currently includes speakers, a seven-channel AV processor, and the AVXP1 seven-channel power amp reviewed here. If IOTA’s goal is to deliver unbeatable price/performance, then it’s certainly off to a good start as far as this multichannel amp is concerned. You can buy the AVXP1, which is reasonable for seven channels of solid grunt. The company hasn’t skimped on the build quality either, with the kind of weapons-grade construction that I like to see in a higher-end product. In fact it scores a definite nine out of ten on the bad back scale, weighing in at a hernia- inducing 30.3kg – double the heft of Emotiva’s slimmer seven-channel BasX A-700 model [see HCC #278]. 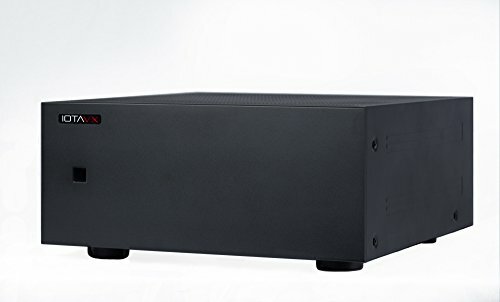 As you’d expect from a power amp there’s a simplicity to its design, with a minimalist metal construction and a matt black finish. Aside from the company’s name, the only thing on the front is an illuminated power switch. This glows red when off, white when on, and if there’s a problem it blinks. There’s a bit more going on around the back, with seven sets of phono and balanced XLR inputs. Between each of the two types of connection is a little selection switch that you flick, depending on which one you’re using. In addition there are good-quality binding posts for the seven amplifier channels, a 12V trigger, and a 3.5mm jack for synchronising the amp’s front light with IOTA’s AVX1 AV processor. 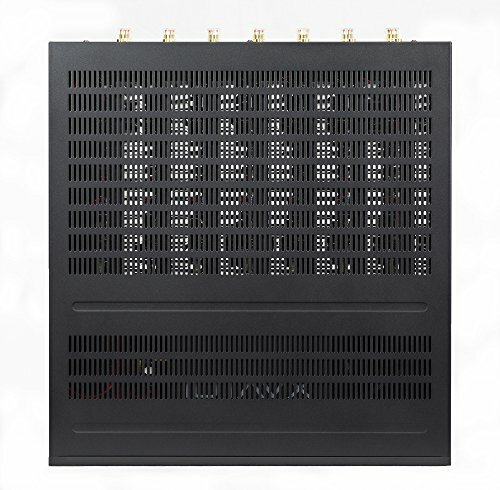 The spec sheet is brief but makes for impressive reading, with the Class AB amplification claiming power figures of 7 x 110W (8 ohm) and 7 x 170W (4 ohm) – stepping up to 150W (8 ohm) and 250W (4 ohm) when driving two-channel systems. If IOTA is to be believed, and its numbers appear realistic, that’s a serious amount of aural potential. For the purposes of this review, I fed the IOTA from Yamaha’s CX-A5200 AV processor [see HCC #292], using my reference M&K Sound S150/S150T speakers in a seven-channel setup. This is the most likely configuration but even if you don’t have an AV processor, this powerful amp offers other possibilities. For those with an AV receiver with seven-channel pre-outs, the AVXP1 provides the opportunity to take full advantage of your existing processing, while beefing up the amplification at the same time. I’ll wager this dedicated amp can deliver more sonic slam than the built-in amplification of most receivers. To test this out I also paired the AVXP1 with my Arcam AVR850, essentially using the latter as a processor. 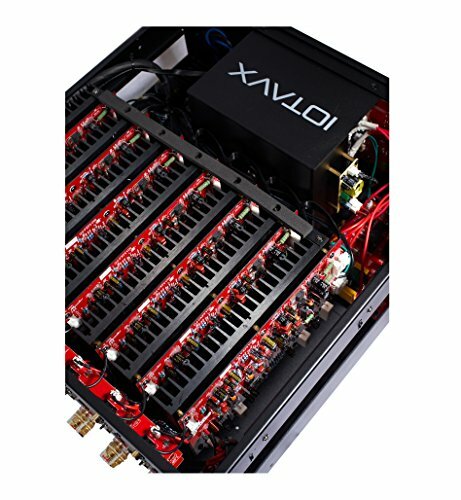 Soon after firing up the CX-A5200/AVXP1 combo I realized IOTA’s claimed power numbers are based on real-world performance, rather than simply driving the amp to destruction and using the measurement taken right before it blew up. I was pleased to discover it also had no problems driving my M&K Sound speakers, all of which are rated at 4 ohms. I was immediately impressed by the sense of space and scale that it imparted to the epic soundscapes of Suede’s new album The Blue Hour. There was a simple reason for this: headroom. The amp had power to spare, transient peaks were delivered with precision and even when I turned the volume up to Glasto levels this beast remained totally unfazed. With modern multichannel movie soundtracks, where the channels are often used simultaneously to create a more immersive experience, a power amp will prove its worth. A good example is The House of Flying Daggers (Blu-ray), and it’s justifiably famous drum sequence. As small stones hit drums positioned in a 360-degree soundfield, the amplification needs to be both tight and responsive, keeping pace with the action as sounds bounce from drum to drum, and thus from one channel to another. The Yamaha/IOTA pairing delivered this with wonderful speed and precision, rendering effects with crystal clarity and producing a gutsy sense of impact. There was also a nice balance to the system, especially when a bowl of stones is thrown in the air, and sounds emanate simultaneously from every speaker, energizing the entire room. The Ultra HD Blu-ray of Interstellar boasts another dynamic mix, particularly the scene where the protagonists try to escape the gravitational pull of a black hole. With this setup, as the spaceship struggled to pull free, it sounded as though the entire room was being torn apart by extreme gravitational forces. As the fuselage rattled, the AVXP1 was able to maintain power to all the speakers evenly, helping to create a cohesive soundstage. There was a refined quality to the sound that I really liked, allowing me to pick out all the small details in the mix, plus an immediacy to dramatic shifts in volume. Switching to the Arcam AVR850 revealed that despite its relatively inexpensive nature, the AVXP1 is able to complement even the best processing. Watching Unstoppable on Blu-ray, this particular pairing handled the aggressive sonics of this runaway train movie with a massive dynamic range that was both precise and responsive. Viewing the same scenes using the AVR850’s built-in amplification revealed the benefits of its Class G implementation, which is essentially a hybrid of Class A and Class AB. I felt the Arcam’s own power revealed improved transparency when compared to the IOTA, thus retaining a better sense of reality. Having said that, the AVXP1 gave an excellent account of itself and the greater efficiency of Class AB obviously makes it much cheaper. 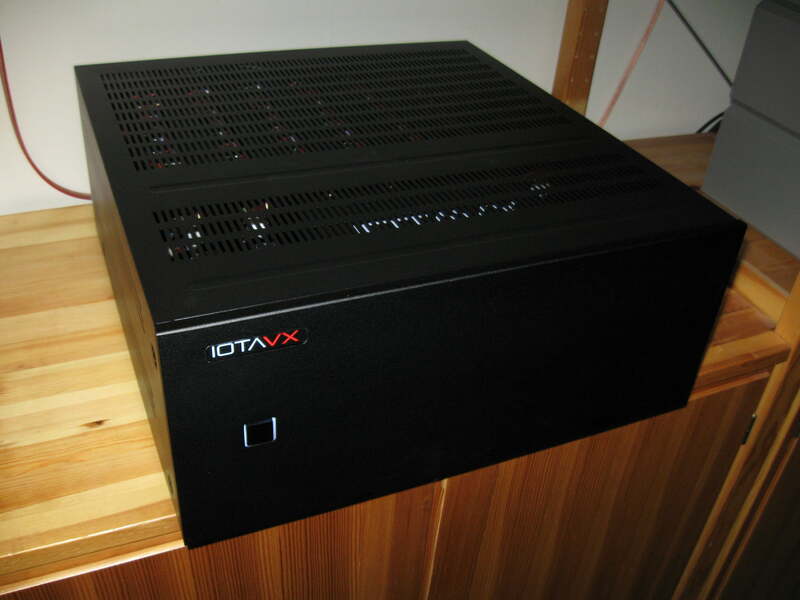 The IOTA’s performance with the AVR850 is interesting because it raises the possibility of matching the amp with Arcam’s more affordable AVR390. This includes exactly the same processing, features, and Dirac Live room EQ as the more expensive AVR850, but lacks the Class G grunt. The addition of the IOTA would likely raise the performance of the AVR390 to new heights, resulting in a tasty combo for just over three grand. 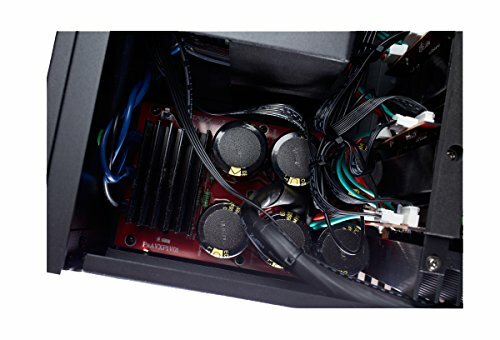 If you have a decent multichannel AV processor or receiver, this affordable seven-channel power amp is an effective way of elevating your system's performance. 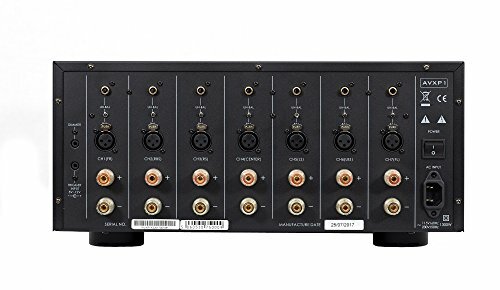 Object-based audio doesn’t feature here, but otherwise this 7.1-channel processor is up-to-spec HDMI-wise, with 4K HDR-enabled inputs/ output. Balanced XLR connections and styling match IOTA’s amp.